Getting your pet surgically sterilized is the best way to prevent possible life-threatening reproductive illnesses. If your female pet is spayed before her first cycle, her risk of breast cancer is reduced by 90%. Additionally, spaying completely eliminates infections or cancer of the uterus and ovaries. If your male pet is neutered, the possibility of testicular cancer is eliminated, and neutering greatly reduces the chances of your pet developing prostate disease. TPLO is a surgery performed on dogs to stabilize the knee joint after ruptures of the anterior cruciate ligament. In the majority of dogs, the ACL ruptures as a result of long-term wear and tear. It is felt that genetics play a role in this condition. Certain breeds are predisposed: Labradors, Rottweilers, Boxers, Golden Retrievers, German Shepherds, Newfoundlands, and Great Bernese Mountain Dogs. Other factors such as obesity, individual conformation, and trauma also play a role. Normally, the ACL prevents backward sliding movement of the Femur relative to the Tibia. Due to selective breeding, the tibial plateau slope has become sloped too far backwards so there is a constant stress on the anterior cruciate ligament. When it ruptures, the joint becomes unstable, which causes pain and leads to arthritis of the knee if not stabilized. In a TPLO procedure, the tibial plateau, the top potion of the tibia is cut and rotated so that its slope changes to approximately 5-6 degrees from the horizontal plane. The TPLO surgery generally results in faster recovery times compared to other procedures. Most dogs (over %90) are expected to regain a very active and athletic lifestyle. 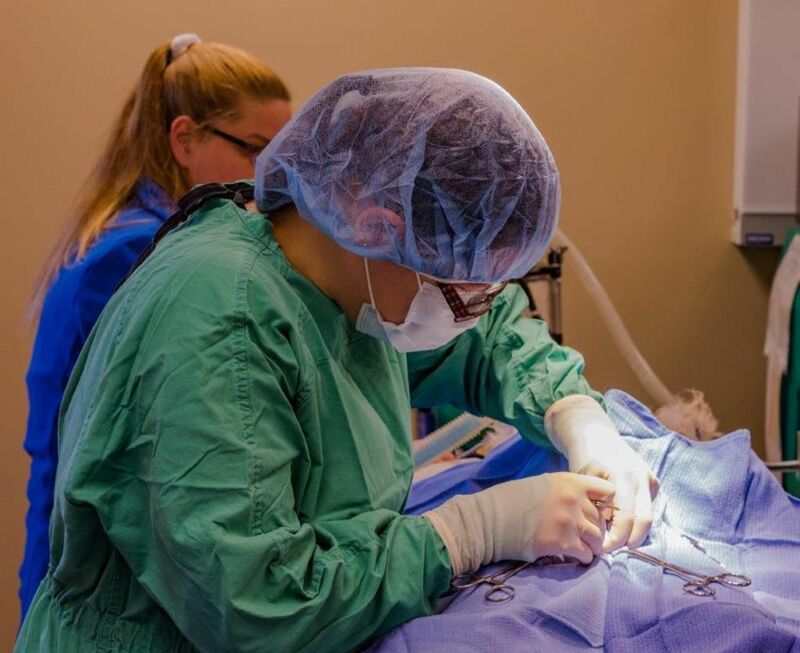 FHO is a surgical procedure that we perform on dogs that have hip dysplasia, or on dogs and cats who have a fracture or arthritis of the hip joint. With this procedure, the head and neck of the femur are removed so that the “ball” no longer rubs painfully in the socket. In animals with a fracture of the hip, this surgery corrects a painful problem that is difficult or impossible to repair. Most patients regain full or close to full use of the leg. This is a very common orthopedic condition of dogs and occasionally of cats. It is especially common in small and miniature breeds. With this condition, the patella dislocates or moves out of its normal location. This surgery involves deepening the groove that the patella sits in, loosening or tightening the capsule on either side of the patella, and moving the attachment of the patella medially or laterally as needed. We expect either full or close to full return to use of the leg. One of the most common orthopedic surgeries that we perform is fracture repair. The most frequent cause of fractures in dogs and cats is from being hit by a motor vehicle. Depending on the patient and the nature of the fracture, the methods we use to repair fractures include bone plates and screws, intramedullary pins and K wires, external fixaters, and splints and casts. This is a surgery that is performed to stabilize the knee joint after ACL tear. This surgery is performed on patients that are too small for TPLO surgery. This includes dogs 20 lbs. and under and cats. This procedure can be performed on larger animals, but the success rate is not as high as with the TPLO. This procedure involves removing the torn ACL and inserting an artificial ligament to stabilize the knee.